If you’re going to watch a perfect game by a Giants pitcher, doing it at the one Bay Area–themed bar in Brooklyn is a wise choice. And if you’re going to throw a perfect game, striking out 14 batters and propelling yourself into discussion for the best-pitched game in the history of baseball is a great way to do it. There are a million factors that go into rating the quality of a pitching performance like Matt Cain’s 10-0 perfecto win Wednesday night. You could ding Cain for facing a weak Astros lineup. You could raise an eyebrow at some of home plate umpire Ted Barrett’s generous ball-strike calls (Barrett was also behind the plate for David Cone’s perfect game against the Expos in 1999). You could note that it never happens if not for Gregor Blanco’s unbelievable catch (watch the whole clip; the Spanish-language call is phenomenal). And if you wanted to be really cynical, you could squawk about this being the third no-hitter in 13 days (first time a streak like that’s happened in 95 years) and the fifth perfect game since July 2009, meaning nearly one-quarter of all perfectos ever thrown have happened in the past three years. • Start with 50 points. • Add one point for each out recorded, so three points for every complete inning pitched. • Add two points for each inning completed after the fourth. • Add one point for each strikeout. • Subtract two points for each hit allowed. • Subtract four points for each earned run allowed. • Subtract two points for each unearned run allowed. • Subtract one point for each walk. Wood’s top score was his 20-strikeout masterpiece in 1998, also against the Astros (a very good Astros offense with Craig Biggio, Jeff Bagwell, Moises Alou, and others, though). It wasn’t a no-hitter, but a 20-year-old(!) Wood ceded just one hit and walked none in the game, making the amazing 2012 performances of 19-year-old Bryce Harper and 20-year-old Mike Trout seem trite by comparison. Nolan Ryan threw seven career no-hitters and was generally considered one of the toughest pitchers of his generation to hit, causing a disconnect between those who consider him one of the top handful of pitchers ever and others who point to his career walk rate of more than one every other inning and downgrade him a notch. No one denies his incredible longevity, though: Ryan’s 101 Game Score came in a 1991 no-hitter against the Jays, in which he struck out 16 batters and walked two. He was 44 years old at the time. Sandy Koufax’s 101-earning perfect game elicited what might be the best radio call of any sporting event, ever. 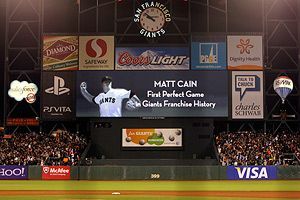 For Cain to rank with three such iconic performances seems improbable, at least until we’ve had time to digest what just happened: The most strikeouts ever recorded in a perfect game (tied with Koufax), a 125-pitch performance that saw Cain throw hardest (94 mph) in the game’s last three innings, and the first perfect game in the history of the illustrious 130-year-history of the Giants franchise. Thanks to ESPN Stats & Info and Elias Sports Bureau for the intel.